ADA Compliant transfer and roll-in showers and tub/showers. 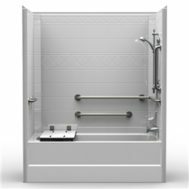 Best Bath Systems manufactures a full line of commercial composite shower surrounds and bathtub/showers that meet ADA bathroom accessibility and safety guidelines. All Best Bath ADA showers adhere to standards for size, shower pan clearance, shower chairs, grab bars, hand-held shower head and faucet controls. 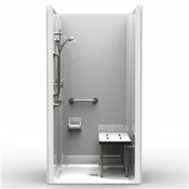 Backed by our exclusive 30-year limited warranty, ADA complaint showers and tubs are built for the demands of commercial facilities. We have supplied healthcare facilities, assisted living centers, retirement communities and university dormitories throughout the US. ADA/ANSI Compliant Shower Packages complete with all required equipment make ordering easy. You can rest assured that you have ordered the correct product to meet all federal, state, and local codes. Bestbath “Need It Now” ADA shower packages are processed within 24 hours of your order placement. All packages include all accessories and are ADA/ANSI compliant when fully equipped. All Bestbath transfer showers comply with ADA 2010 608.2.1 transfer type Shower Compartments. Transfer type shower compartments shall be 36 inches by 36 inches clear inside dimensions measured at the center points of opposing sides. They shall have a 36 inch wide entry on the face of the shower compartment. 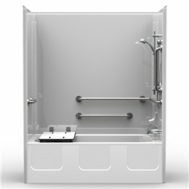 All Bestbath roll-In Showers comply with ADA 2010 608.2.2 Standard roll-In type shower compartments. 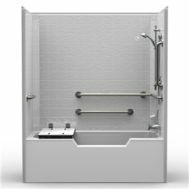 Standard roll-in type shower compartments shall be 30 inches wide minimum by 60 inches deep minimum clear inside dimensions measured at center points of opposing sides. They will have a 60 inch wide minimum entry on the face of the shower compartment.